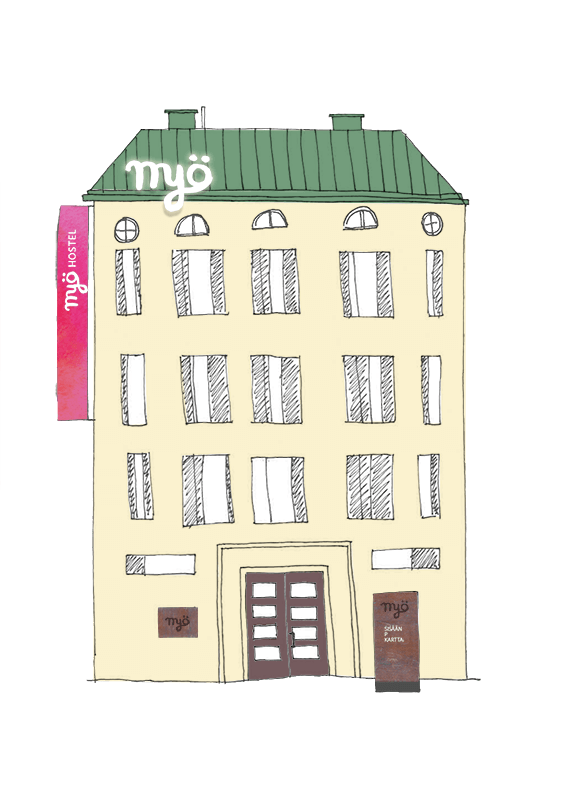 Myö Hostel is located in a historical hospital courtyard, in the charming Ruskeasuo district. The Central Park starts from our backyard and offers endless possibilities for outdoor activities, such as football, horseback riding and a hundred kilometres of nature trails. Local services, such as grocery stores, restaurants and wellness services are all very close by. Our hostel is easy to reach, whether you arrive by plane, your own car or public transport. There is a bus stop right in front of our hostel, and you can reach Kallio district, Linnanmäki amusement park and the central railway station in no time. A tram stop and more bus stops (Airport, Kamppi bus station, Espoo etc.) are located just a few hundred metres from Myö Hostel.